Enjoy the seven legendary back bowls full of soft power that span 6 miles, the natural terrain that mimics a backcountry skiing experience in Blue Sky Basin and the 127 runs on front side of Vail Mountain of both groomers and moguls. 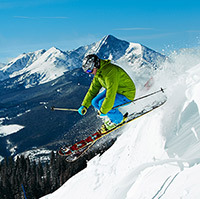 There is truly something for everyone when it comes to skiing Vail. Make sure to visit our Vail page to view stats, terrain information, and helpful maps. Save your valuable vacation time by purchasing your ski passes online before you even leave home. You can avoid paying ticket window prices for lift tickets by going to vail.com and buying your passes at least 7 days prior to your departure for Colorado (14 days for international guests). The passes will be sent to you so that you can go directly to the lift on your first day of skiing. Your lift tickets are valid at Vail, Beaver Creek, Breckenridge, Keystone and Arapahoe Basin – all within a 40-mile radius. And remember kids 4 and under ski for free! For information and questions about the PEAKS Loyalty Reward Program, please call 800-226-0355. -Vail Village Ticket & Pass Office at the base of the mountain, just west of Gondola One Still have questions? Call a ski pass expert at 800-842-8062. Whether you’re an expert skier or rider, or you’ve never seen snow before, Vail has a skiing or snowboarding program that will challenge you. Choose from half-day, full-day or multi-day; private or group lesson programs. Vail Children’s Ski and Snowboard School instructors have the patience and personality to get kids on the slopes and keep them smiling. All of Vail’s programs are divided by age and ability level to ensure an incredible learning experience on the snow. Give children a solid foundation for a lifelong love of skiing and snowboarding at Vail’s Kids’ Ski School. Lessons are available for kids between 3 – 15 years old. Choose from traditional group lessons for kids 3 – 12, the Ultimate 4 semi-private group lessons, Learn.Turn.Ride for those who have always wanted a “slam-free” snowboarding experience, Ski Girls Rock! designed specifically for girls ages 7-15 (available during specific holiday periods) or Teen Lessons for 13-15-year-olds. Packages including lift ticket will give you the best value. Helmets are required for all children participating in Vail Ski & Snowboard School. Rental helmets are available from all ski equipment rental companies as well as at Children’s Ski & Snowboard School locations. For more information or reservations go to vail.com or call 970.496.4800. It’s never too late to learn a new sport or sharpen the skills you already have. Group lessons are available for all levels of adult skiers and snowboarders. Full day lessons run from 9.45am-3.30pm. One-day or three-day packages are available. If you’ve never skied or snowboarded before, sign up for the three-day First Time Series. Beginner lessons and lift tickets are bundled together for one great rate. Half day Max 3 semi-private lessons and beginner snowboard lessons are also an option from 12:45 – 3:45pm for Alpine Levels 5-9; these may be booked at the Adult Ski & Snowboard School Office in the village or by calling (970) 754-8245.